Cauliflower (Brassica oleracea var. Botrytis): growing, planting, caring. Cauliflower needs seven months to grow, but you'll appreciate it all the more once its on your plate and smothered with cheese. Cauliflower is a biennial plant that enjoys partial shade in cool soil that's deep, humid and rich. Cauliflower, and cauliflower romanesco, also mentioned on this page, can be planted in spring around March/April, sheltered for fall harvest or after the first frost for a winter harvest. Important note: cauliflower are greedy little beasts. Expect to wait five years before growing cauliflower in the same place! Cauliflower is a herbaceous biennial with a meristem, the pre-flowering organ which is edible. This then forms floral stems which carry white or yellow flowers. The leaves are thick, veined, blue-green, and measure about 20 cm. Transplant your cauliflowers sowed under shelter after the last frost, when they have at least 3-4 real leaves in open soil in a soil that is loose, cool, moist, and rich in partial shade. If the earth isn't correctly fertilized prior to planting, put a little bit of compost at the bottom of the hole while planting. Plant every 60 cm, possibly treating the roots/root ball to prevent drying. Form a basin and generously water each plant. 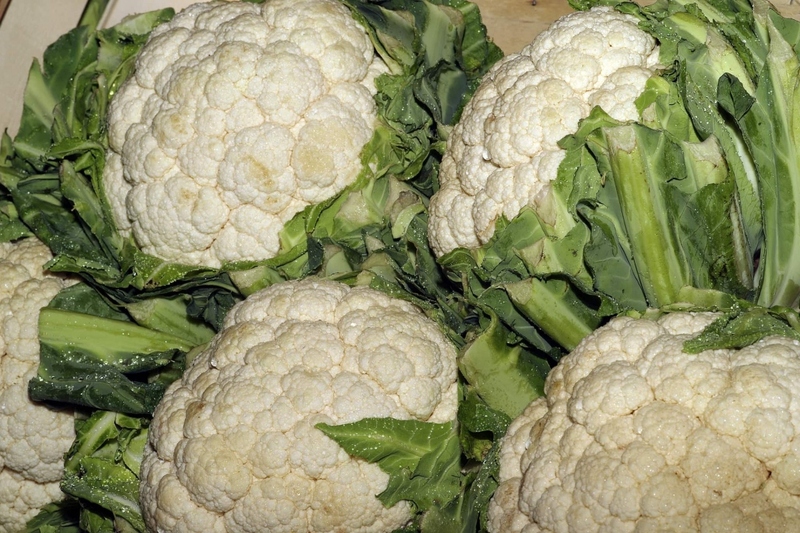 Cauliflowers can be sown in rows starting in May or June. Plant in open soil, where the earth is deep, cool, sandy and not fully exposed to the sun. Water after sowing. You may seed starting at the end of March/beginning of April under a greenhouse tent or cold frame for an early harvest. Quick note! Cauliflower seeds are rather small... Mix them with a bit of sand to help sow them more evenly. Plant cauliflowers bought in small pots from a store after the last frost in open soil in a soil that is loose, cool, moist, and rich and in partial shade. If the earth isn't correctly fertilized prior to planting, put a little bit of compost at the bottom of the hole while planting. Plant every 60 cm, possibly treating the roots/root ball to prevent drying. Form a basin and generously water each plant. The cauliflower doesn't like dryness, so mulch a week after planting — if possible, use what you have at hand — dead leaves, grass trimmings! Careful of frosts! Protect your late cauliflowers from the winter cold with a winter veil or a thick layer of mulch starting in November. Outside of sowing, transplanting, or intense drought, watering is useless for plants in open soil. On the other hand, after sowing or transplanting, be attentive: - Water after sowing with a light shower so as not to destroy the young sprouts. - Watering after planting/transplanting can be carried out with a spurt or watering can but refrain from wetting the leaves. - If potted, and depending on the quality of your mulch and on the situation, your cauliflower may need an additional supply: watch each week and water if the substrate is dry! - Finally, watering in the summer may be necessary in the event of extreme heat for your cauliflowers in open soil. You can harvest the cauliflower 7-8 months after planing, when they are well formed and before the flowering.